I had the car and some time on my hands, so I drove up to Colfax with my mountain bike in tow and hit the trail by7:30 am. 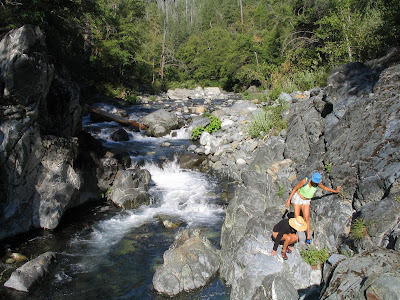 Ah, what a delicious time to be hitting a North Fork trail! Of course, throughout the years I had always raced right past Colfax, on my way to “bigger and better places”, because, obviously, there was nothing there, right. I mean, Colfax? C’mon! Ah, but how nature’s secrets are so slowly revealed sometimes, if at all! I figured, too, with my early start that I could get a jump on any crowds that might descend this multi-purpose and historic trail, having read on the Internet with a resigned sense of “oh-well-I-can-deal-with-it” about overflow parking, equestrians, hikers and bikers galore who cherish the “easy” switch backing traverse of nearly 1300 feet and four and a half miles to the river. I figured I’d have at least an hour, maybe more, of peace and quiet before the hordes arrived. 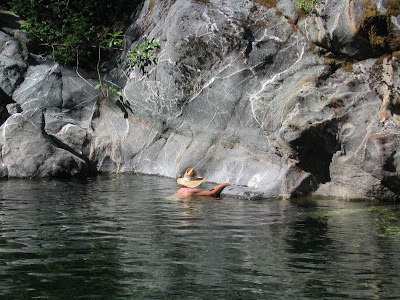 I figured I could always bush up or downstream, too, to find a secluded nook all my own beside lavish pools and hot rocks. I bid hello, and adieu, to a father (Scott Peterson look alike) and his young son at the trailhead, then tore off down the narrow rocky trail on my Gary Fisher, down, down, winding, winding, veritably zooming along without having to worry about anything or anybody except concentrating on navigating through the obstacle-laden trail—quite technically challenging, even for an “old hand”. More than once I got off and walked my bike across some sketchy stretches. I did not need to injure myself! Soon, the canyon views opened up. Iowa Hill Bridge was way down there on the shimmering ribbon of river, and it was all I could do to occasionally look out and catch glimpses of it without missing a curve or slipping off the edge of the two-foot wide trail that just dropped off hundreds of feet below. 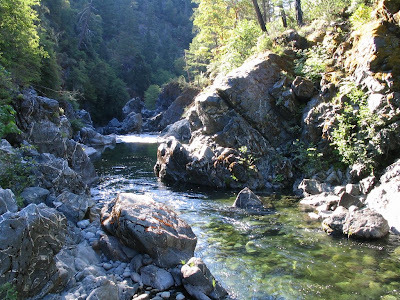 By the time I reached the main level of the North Fork, maybe a hundred or so feet above, I had encountered exactly two backpackers coming out and one older man. The father and son duo eventually reached the river in a couple of hours and I saw and waved to them as they explored in their underpants. 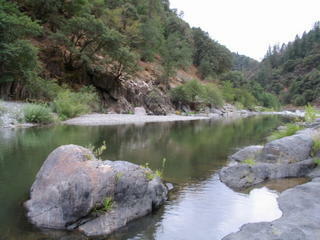 This new view of the North Fork American River simply stunned me—I had not expected such grandeur! 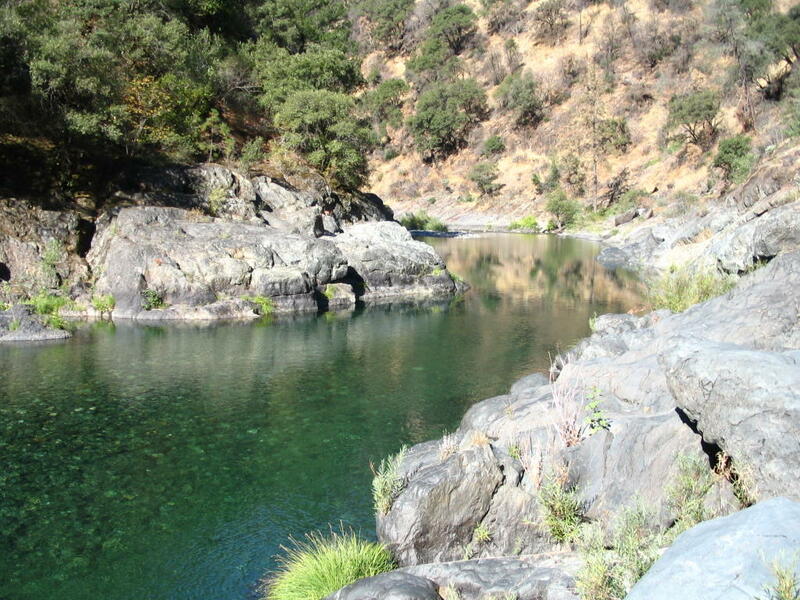 The river was anfractuous, narrow, and often lazy, gathering here and there in huge blue-green pools of amazing clarity and depth—in fact, this one pool in particular at the very end of the trail (where I figured the hordes would soon be descending, for it must be famous among locals and those in the know) just blew me away, instantly jumping to the top five of my favorite all-time pools. Rimmed by a wall of rock thirty feet high on the south side that curved around like a small amphitheatre for twenty feet or more, this legendary limpid pool measured, I’m guessing, sixty feet across and one hundred feet wide, and was, without exaggeration, probably thirty feet deep in places. 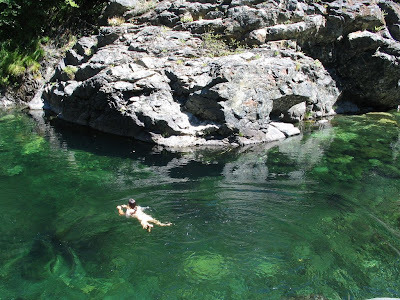 I jumped in, the day already hot this early in the morning, and was engulfed by the most delicious, velvety and, for the North Fork, warm water I’ve ever swum in! It was absolute paradise! 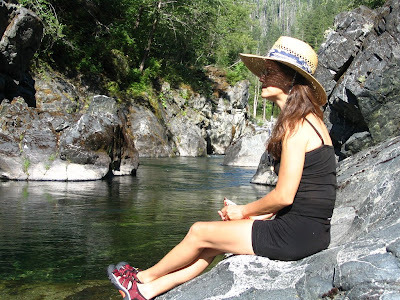 I gathered myself together and hiked a thread of the trail upstream, see what I could see. The rocks along this portion of the North Fork (help me, here, Russell!) 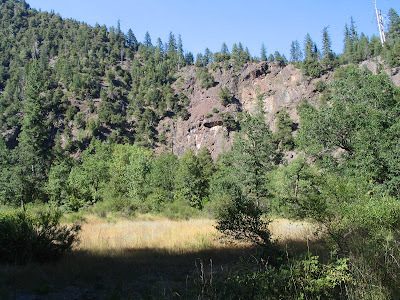 were alternately dense and creamy-like, and tortured and fractured of the type seen around the “little red gorge” at Big Granite/NFAR confluence. 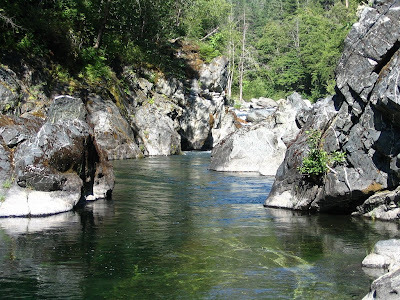 The dense, creamy boulders spilled down to and beneath the river’s surface, disappearing into the bed, sculpted into fantastic shapes and polished smooth as marbles. 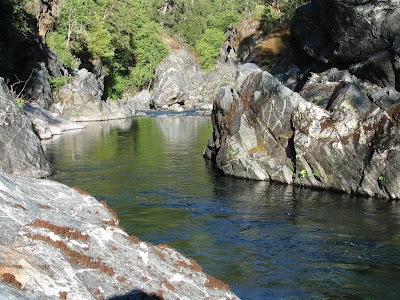 One stretch of the river here was particular lazy, stretching perhaps 500 feet or more and no deeper than to your knees, layered with colorful, shiny rocks that glistened in the sunlight like jewels. It was an amazingly peaceful and beautiful scene! Farther along, I heard our old friend, Canyon Wren, sing her loud, clear, joyous whistle, and watched water ouzels flirt and skirt at small waterfalls. 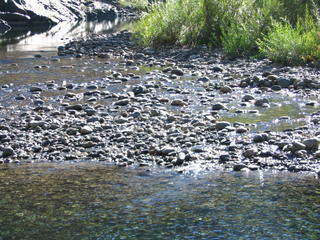 Then I heard a muffled sort of gurgling noise, and turned to see a pride of ten brown ducks swimming along in unison. They were so merrily proceeding it made my heart sing. They had dark brown necks and light brown bodies. I looked in my bird book and was unable to recognize the species from the pictures. What do you think they were, Russell? 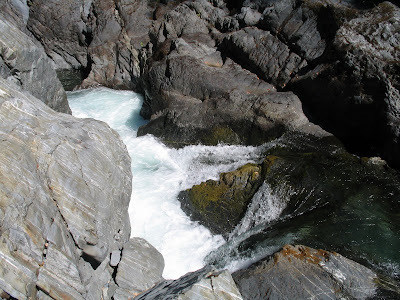 At one point, they approached a flurry of water spun madly about by protruding rocks, and I could see them visibly getting excited, then with aplomb, one by one, they jumped the little falls and continued on their way upstream. 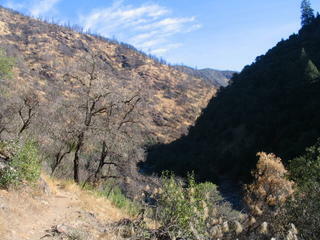 By this time, the trail had completely petered out and it was all bush-rocking. 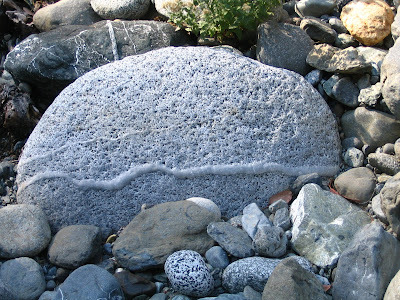 (Quite easy going though, as these shoreline rocks have excellent hand and footholds.) I estimate I had gone about a mile upstream—it’s always difficult for me to gage mileage on the river—let’s say a good twenty-five minutes worth at my quickened pace—when suddenly I looked up, saw a billowing cloud of camp smoke, and there was this guy standing there looking at me, sort of like, where the hell do you think you’re going? I stopped in my tracks, said, hey, how ya doin’? He grunted back at me something less-than-pleasant, then disappeared beneath his rock shelter. Obviously an anti-social loner type. Should I report him to the BLM office? Nah, to hell with it, let him be in peace. I turned around and headed back. On the way back, I spotted a kingfisher, I’m pretty sure. Apart from the tern, the kingfisher is the only small bird that dives headlong from the air into the water to catch fish. I saw him hover briefly, then hit the water, but coming up empty. He flew to a perch on a dead tree and I watched him through my binoculars for about five minutes, a gorgeous little bird indeed. 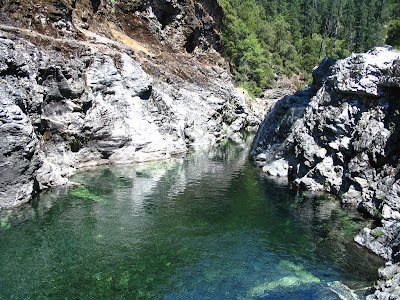 I retraced my steps back to the Big Hole, fully expecting to see it filled with yahoos and revelers. . .but amazingly, no one, except the father and son, were around. Here it was, a gorgeous hot sunny Sunday in July, and there was no one around! 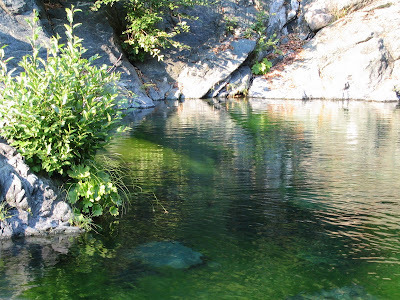 I relished another hour or so swimming, eating blackberries, meditating and ref lecting in solitude, then, just scorched and reddened from the sun (I had forgotten sun block and my hat!) I hit the trail for the long grueling climb back up. . .and it was a long, grueling climb back up! No wonder only the hardiest of hikers, and very few, if any, bikers, come down here. (Equestrians must love it, though.) Before, though, I took another side trail down to another spectacular pool for a final swim. A couple was there, that’s it. Here the river coursed through open bedrock creating waterfalls, waterways, over smooth polished rocks, before spilling languidly into another large pool. But I knew I had to get out of the sun. The main problem down here is lack of shade; the exposure will kill you. And so, back on my bike, I grunted and grinded it out. The first two-thirds were pretty easy-going, but the final ascent found me pushing my bike up nearly the entire way. I was thoroughly trashed and dusty, with a flat tire, by the time I got to the car at 3 pm. 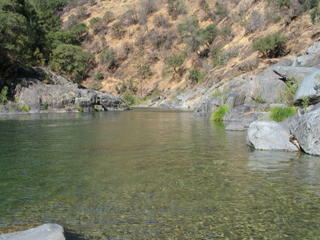 What a thoroughly satisfying day of discovery and fun on the North Fork American River! 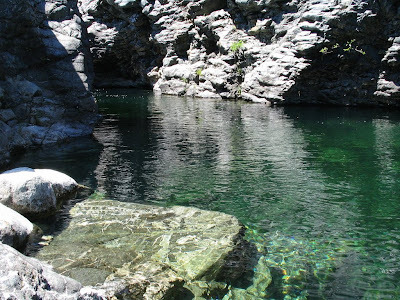 How many other such marvelous, magical, secret places must exist deep in secluded canyons? 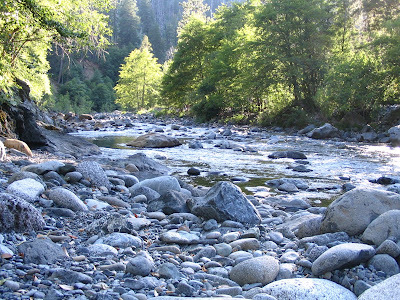 Russell, have you had the opportunity to explore Fork where Stevens Trail ends? Or like me, always assumed there were “bigger and better places” to explore and frolic? 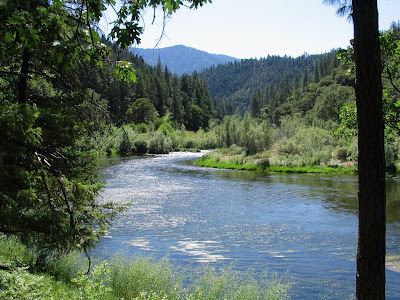 Each year, for the past thirteen seasons around Mary’s birthday, we have made the seven hour trip to camp and hang out on our beloved tributary of the mighty Klamath River. 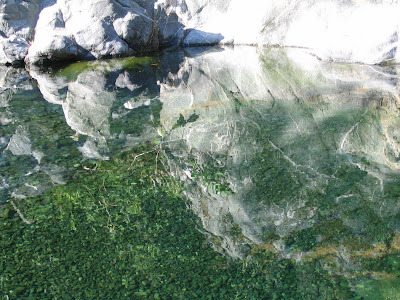 Clear Creek’s virginal waters originate high in the ranges west of the Marble Mountain Wilderness, and runs its 23 mile course through an ancient canyon gouged out of raw earth and bedrock, wearing down tortured boulders into jagged and jumbled banks, n arrow channels and gorgeous pools of jade green water flowing wild and pristine as a mountain creek should. The area is home to the Karuk Indians, who hold these lands sacred since time immemorial—Katamin, they call it, the center of the world. 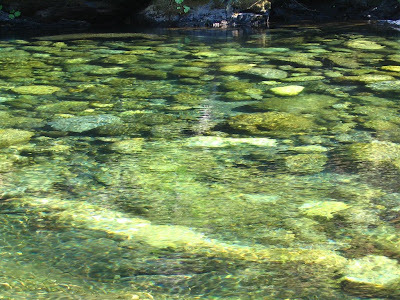 They continue to practice their rites, holding their annual World Renewal ceremony near the mouth of Clear Creek to ensure their survival and the return of salmon and acorns. Known as Pic-Ya-Wish, the Karuk request the cooperation of rafting companies and river adventurers to avoid certain areas of the river each summer. Although the Ka ruk are the second largest native American tribe in California, they live in relative poverty and isolation scattered on and about reservation lands along the Klamath. They do not enjoy the casino wealth associated with other California Indian tribes, and make do with preserving their rituals and culture in the face of massive acculturation. Being so far removed from urban areas contributes to their strong cultural identity today. 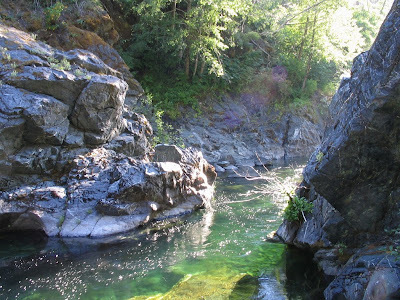 Clear Creek is blessed with primo camp sites (gotta know where to find ‘em), thick and healthy forests on upper slopes, including home to the rare Port Orford cedar, deep and bracingly cold swimming holes (although since the fire of ‘94, the water has gotten progressively warmer), crashing waterfalls and rapids, bear energy abounding, and best of all, it’s virtually people-free! 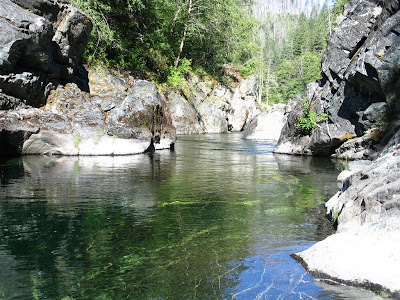 Fortunately, or unfortunately, depending on your perspective, the Forest Service has opened up this sector of the Klamath National Forest—leading into the Siskiyou Wilderness—to vehicle traffic. Otherwise, it would be a grueling hike in. From ultra-scenic Highway 96, you take an eight mile gravel road (passenger cars can do it easily) to the trailhead. It used to n ot be marked, and we got confounded on more than one occasion, turning down wrong old logging roads. Once, with our amigo, Acapulco Javier, we got so turned around, in the heat of the day to boot, that we spent over two hours traversing those dusty roads as though we were in the Twilight Zone. Today, signs are posted so that any yahoo can make it to the famous pools without getting lost. The great thing about this special spot is you can get to it without the rigmarole and rigor of a hot and dusty trail hike. You can have your cooler with ice and beer and whatnot. You can set up chairs and bring excess reading matter. You can have a box of prettily wrapped presents for your lovely wife to open with childlike glee. Sure, it’s the dreaded and lazy car camping syndrome. . .and yet, paradoxically, once you’re down this little nothing of a fifty foot trail, you might as well be miles and miles in, that’s how remote-feeling this spot is. 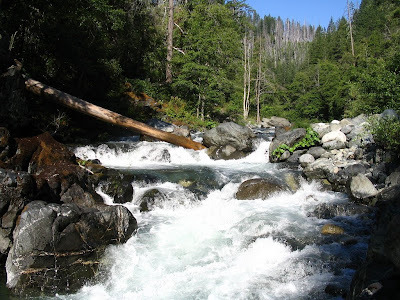 Without doubt, it is the prettiest, wildest, ruggedest stre tch of the eastern watershed of the creek. And there you preside, ruling over your pristine domain, no longer too much of this world. So, what to do? Simply REJOICE IN THE WAY THINGS ARE was my lovely wife’s advice. Just like last year, when we were discouraged from hiking into our original camping spot because of Veronica Selvage’s “big bad bear warning” (she was a ranger at the station who was actually referring to Trout Camp, miles downstream), and we got all in a tizzy over it, we ended up “discovering” the special pull-off spot that we had by-passed mindless for a dozen years. 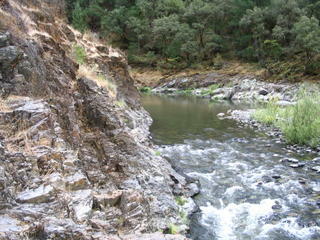 This time we ended up camping way above the creek a mile back at the ever-ignored Slippery View creek access. Turns out, the camping was A-OK, and Slippery View was sweet, although as the name implies, it was a rough and tumble 200 foot descent. 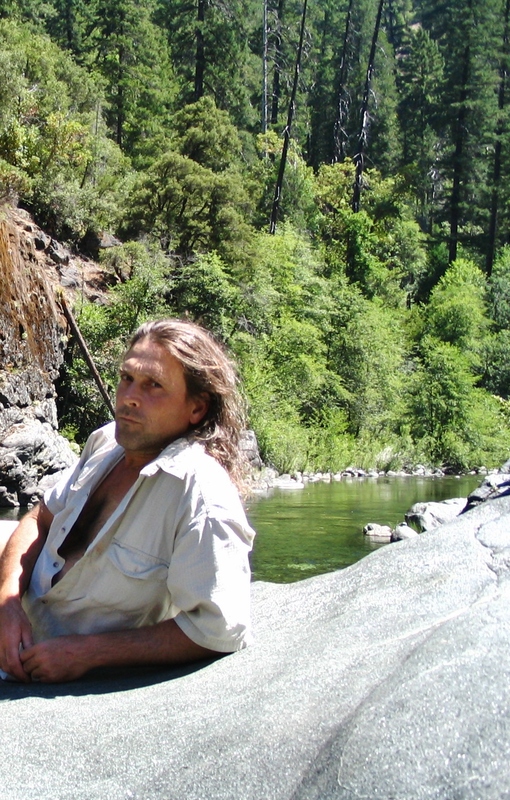 The next day I approached the campers—an herbalist d ude who looked like Jesus Christ, and his hippie woman friend, and their ten year old daughter. They were leaving by Saturday noon, so we would have two nights, at least, at our special place. Once they finally left (God, please vacate the premises NOW, folks! ), and we reclaimed, or assumed, our rightful positions, heaving huge sighs of relief (really! ), we felt like we had (really!) arrived home, to a familiar and sacred place. A typical day at Clear Creek? Think of sloooooowing waaaaaaay doooooown. Imagine walking in meditative mini-steps. Certainly the 108 degree temperature helps, but the exercise is to deliberately gear it down s everal notches. It is revolutionary to just wind down, let go, not rush, not think, not do. . .just be. And that is when the animal magic happens! Over the past five years we have sought out our animal totem(s) in these nature immersions—nothing like a vision quest, mind you, but still, a thorough immersion in the other world of plant, tree, sky, water, earth, rock, animal. Only the occasion plane overhead or redneck or Christian-group incursion reminds us otherwise. And each year, without fail, a certain animal is attracted to us, or we to the animal, and then back home we pick that animal from the animal “Tarot” deck my sisters g ave me for my birthday! It has happened eight times in succession that we identify our animal guardian spirit, or whatever you want to call the zoologic visitation, and then end up picking that very animal from the deck of cards! It is not just coincidence! There are 55 cards to pick from. 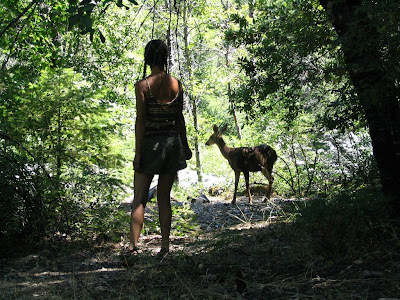 More likely, as one of the sisters put it, we are psychically connecting to animals, they to us, in a shamanic sort of way. Just like you can live your daily life like a Buddhist, without ever being a Buddhist, or even thinking about Buddhist principles and precepts, just by living a simple, peaceful, honest ahimsa-based lifestyle, you can also live your life like a shaman, invoking your own brand of inner magic and spiritual connection to all beings of the earth, including plants, animals and rocks, t he “Spirit-That-Moves-Through-All-Things”. Being in the wilds of nature helps to nurture this innate relationship we all can attain with our natural surroundings. But you have to be open, aware, alert, and above all, without hubris or clutter in your heart. My psychic-spiritual connection with the animals this season of Mary’s 44th birthday surpassed previous experiences only in quantity. This year, I had several amazing experiences involving Clear Creek residents. I’m only reporting what happened; you draw your own conclusions. 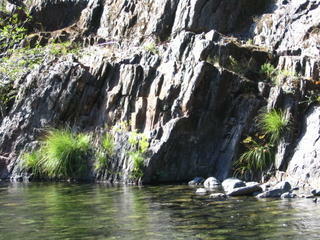 FIRST day down on the river, we immediately noticed the paucity of our flittering and favorite friend, Dragonfly. Where were they? What was going on? 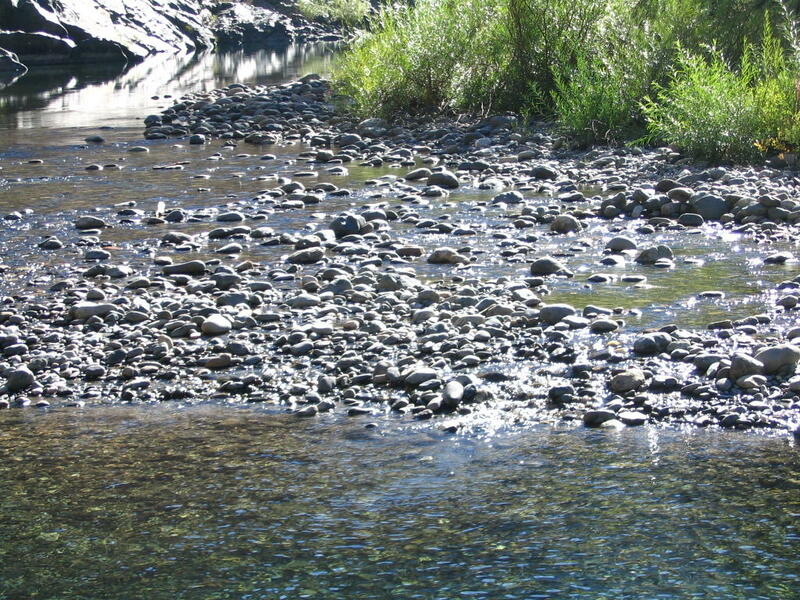 Being major patrollers of the canyon waterways, their absence for nearly two days was striking. We literally did not see a single one. Very odd. Something was going on. Not being an entomologist, I hadn’t a clue. So, instead I perched on a boulder in the creek, opened my heart to the universe and beseeched Dragonfly to please pay a visit, come out come out wherever yo u are to show us everything’s OK. Within one minute, the biggest, baddest Dragonfly came flittering right by us! How did my evocation coax this creature out of her den? OK, go ahead, be unimaginative and call it a coincidence. Call all of the episodes a coincidence! Fact of the matter is: as the day wore on, dragonflies began coming out and soon were out and about in near usual numbers. BEFORE Mary’s birthday on the 17th of July, I had said to her, “Honey, you will have a special visitor on your birthday.” Now, why would I make such an utterance? How did I know? Was I just playing some mental game with myself, trying to think things into existence? So, imagine our surprise (shock) when a young deer fearlessly wandered into our camp on the eve of Mary’s birthday! She approached us like an old friend. I could literally reach out and touch her nose. She had an Osa-like skittish quality, yet calm and determined at the same time (to perhaps get a bite of our food?). Was this a corrupted deer, I wondered? Or just the special visitor I predicted? Whatever, it was a first in all my years of wilderness camping. ON her birthday, we drew the Animal Cards. Mary picked two or three, and twice upside down Beaver came up. (She later picked upside Beaver again at home.) I drew a card and held up Bat. Hmmmmmmm. . .interesting. . .we had usually seen armadas of bats echolocating at the crepuscular hour, but this trip, we saw only one. The next day, in broad daylight, down the creek a stretch where we were sunbathing and swimming, Bat came flying about for fifteen minutes! Say what you will. And that night, there were about five times as many of them as before. Keep on saying it. SO far, it’s been praying, predicting, prescient, and psychic. We have had the pleasure of visiting with ant, beetle, bee, bat, butterfly, bumblebee, bird, caterpillar, cicada, cricket, dragonfly, deer, fly, frog, fish, grasshopper, horsefly, hummingbird, kingfisher, lizard, moth, mosquito, midge, mantis, pheasa nt, spider, snake, squirrel, slug, water strider, wasp, water ouzel. (Oh brother and sister, where art thou, raccoon, bear, bobcat, lion, weasel, skunk, hawk, badger, Bigfoot? )—all creatures great and small we love and admire. SUCH is life at Clear Creek. We’re always sad to leave. . .and yet it is amazing to count up the days and nights spent under the stars at Clear Creek—we’ve passed close to 75 starry nights and hot sunny days there. You get to know a place intimately after that much time. Maybe that’s why—and when—the animals and you are able to connect. - World of rock world of tree world of water world of sky—home to all of our animal friends. . .see you next year same time same place!